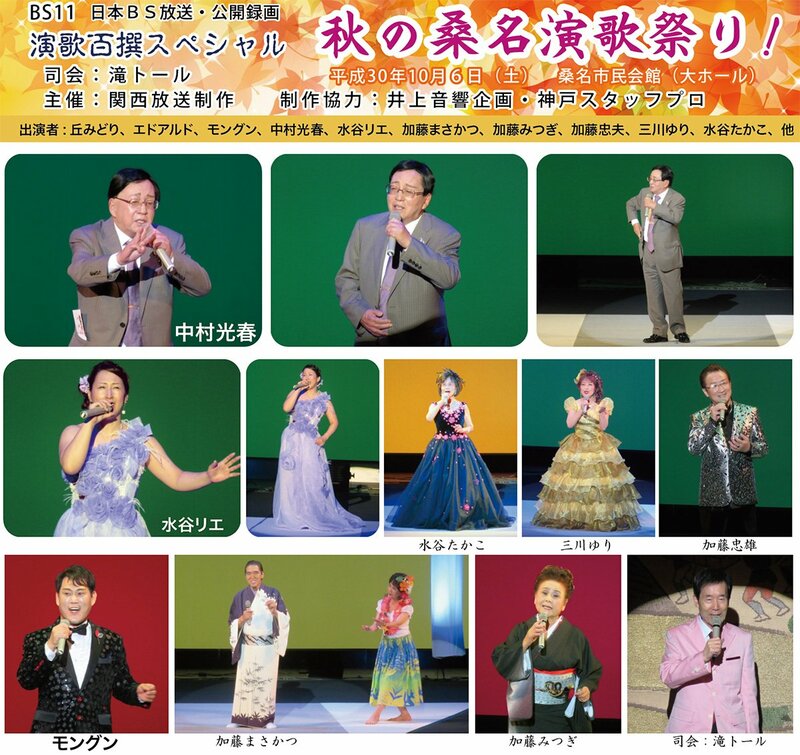 Japan BS broadcast · Public recording "Enka Hundred Choose Special Fall Autumn Kuwana Enka Festival!" Was taken at the Kuwana Municipal Hall on October 6, 2018. NHK Kohaku singing competition participant singer's Midori Oka also sings enthusiastically with the singing ability of the masterpiece. Particularly impressive was the word that she said "I want to be a sort of self-serving singer". And it is interesting this time Mr. Mitsuharu Nakamura who is a producer of Enka Hundred Choose appeared. Mitsuharu Nakamura is an enka singer from Kuwana city, Mie prefecture, saying originally, debuted as a singer in "Healing rain / Two people's treasure" from Tokuma Japan in 1993. On August 21, 2013, King Records released "Grands come! / Yearning" released. On September 24th Heisei 26, Tokuma Japan released "There is song / first star". In particular, "grandchild come!" Is a reputation, it is delivered to DAM (5023-69) and JOYSOUND (Utasuki), and is sung to a karaoke group every day. Mr. Mitsuharu Nakamura got a celebration of acclaim with "Ocori Rain" and "My grandchild comes in!" With a tasty singing voice. When I finish singing, "I will do my best so I will do my best," please say hello. Mizutani Rie, also from the local Kuwana, appeared wearing a nice dress. I enthralled the fan by singing the original song "last flight" with an expanding singing voice. In addition, Miyuki Murata who frequently appeared in "Enka Hundred Choose " did not appear this time, but on October 3, Heisei 30, the female version "Grands come" will be released from WebKoo as a topic Has become. It is said that the CD is selling well, and the future is an enka singers who is enjoyable.